I found this story in The Hartford Courant and thought it might be worthy of discussion. In short, a 1941 federal law requires most military clothing be made using domestic materials by domestic suppliers, but for some time now running shoes have been exempt from the law for the simple fact there are few domestic makers of running shoes. The government’s solution to the problem was to provide $75 per year to members of the military to cover the cost of running shoes. In other words, military personnel buy shoes where they want and are reimbursed for the sneakers. As someone who runs a little bit, I know picking the right shoe is important for my feet, knees and legs. Every person is different. I ran with two pairs of very good quality shoes that did not work for me. A third pair hit the mark. A quick look at Amazon* indicates more than 45 different manufactures providing more than 7,000 choices of running shoes for men. I like choice. I like competition. This paragraph in the story caught my eye. My emphasis in bold. OK, that’s great. If a New Balance shoe works for me, I would buy those shoes even if they cost a few more dollars to support the company. That said, let’s go back to LeBretton’s quote. Dude, there is a competitive bid environment already. The individual military members make individual decisions which is the ultimate “competitive bid environment” in this situation! LeBretton and the politicians are proposing a solution that would decrease choice and may certainly increase the price. My emphasis in bold. So by cutting the brand choice from more than 45 suppliers to one suppliers what will happen? Why is that a good thing? And remember, right now military members have access to 7,000 model choices. How many models of shoes will the one “official” supplier be able to provide? 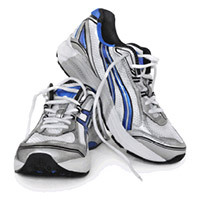 What if the “approved” footwear does not fit or causes knee pain? I understand about “keeping jobs in the USA” but let me be clear, this is all about lucrative federal government contracts that generate a constant revenue stream for the winning bidder. * I buy at a local store that specializes in running shoes. If I bought them online I may save a couple of dollars, but the local store helps me get the right fit and that’s important. It is extremely rude and disrespectful to walk into a store, be fitted for shoes, clothes or something else, only to leave and make the purchase online. Don’t use local retailers as a place to find your size if you’re going to buy online. When troops are being deployed to combat zones without things like body armor, tourniquets, water filtration systems, even staple items like soap and toothpaste; and requests are subjected to weeks- even months of red tape as provided by a bureaucracy whose members keep voting themselves raises and whose personal lifestyles are untouched by manipulative little propaganda “sequester” games- it becomes easy to see how such things like running shoes do not register with the treasonous swine who continue to eviscerate the Constitution… let alone proposing a solution to a phantom issue of needed competitive bidding solution which is tantamount to cultivating diversionary grassroots myopia. i like this take. Yes, we need more jobs and businesses, but if the products are good and priced right, they will be bought. Always will be for choice. for the ideological shoppers out there, new balance is a 70% company.? they do mfr some in maine, which you may or may not consider part of the u.s.?? reebok, on the other hand, is massachusetts-based and are 100% u.s. sourced/mfr’d.? they also have much better arch support, fwiw. it shouldn’t require acts of congress to supply our military with functional, supportive footwear.? let’s file it under ‘preventive care’. given that feet are as different as snowflakes, approved brands by purpose (not location of mfr) and an ample allowance make the best sense.? perhaps the same sort of ‘gift cards’ as ebt and storm victims receive.? part of the uniform/equipment budget, so that they don’t have to pay income tax on it.? or, as stated above, make it a medical expense. you’d think that american companies would consider lucrative gov’t contracts in their business plans–but that would be people who have never dealt with the gov’t in that capacity.? there is substantial risk and restriction in working with the gov’t.? it can ultimately destroy your business–it’s not for the faint of? heart or struggling companies. …competitive bidding.? it’s a spin that obama would be proud of! This brings a new light to voting with your feet. Ideally, I thing that the free market should be what determines suppliers for the military. But, what market is really free? Right now, individuals select the best foot ware that he or she has found to be the best for them. Competitive bidding brings more politics into the mix. Anyone remember their “official” shoes from Cub Scouts or Brownies? How about that first week or two of basic trying to break-in those combat boots? OUCH! Let service members decide their own foot ware. P.S. : I go through two or three pairs of running shoes and two pairs of hiking boots per year. TMI, but $75 does not go too far. Government can always do it better. ?They can award a “competitive” bid for $250 per pair and force the soldiers to wear shoes that hurt their feet. ?All those lawyers and lobbyists need to eat too.